I can't quite believe how beautiful the weather was at the weekend, even with us in the North of Scotland. It was definitely a weekend for BBQs and visits to the ice cream van. Although I still had work on Monday I made sure to take full advantage of the weather and wear some of my new high street items in the process. On Saturday it didn't quite reach the high temperatures until the afternoon so I spent the morning running around getting the chores done and doing a bit of wedmin involving shifting 120 bottles of beer and 36 bottles of Prosecco into safe storage for the next 8 weeks. That was a bit of a workout in itself. I started the day off in some trusty River Island Amelie Skinny Jeans and changed to a pair of denim shorts by late afternoon. 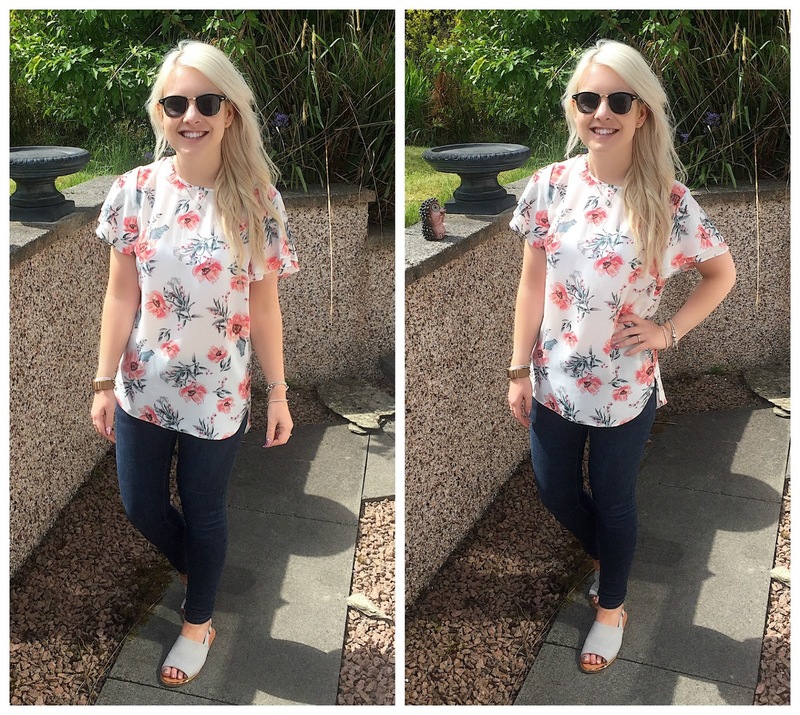 I'm loving my floral print top from New Look, it's lightweight and airy in the sunshine. I had to size down in this top though because it's quite oversized and ended up drowning me. I knew I had a fair bit of walking to do so rather than flip-flops I wore some grey slingback sandals. They are so comfortable and a really stylish option for Summer. On Sunday the sun seemed to be out as soon as I got out of bed. My plan was to spend the day in the garden reading my kindle, housework could wait! I'm currently reading my way back through the Harry Potter books and was quite happy reading Prisoner of Azkaban with some Fanta Lemon by my side and a Solero mid-afternoon snack. 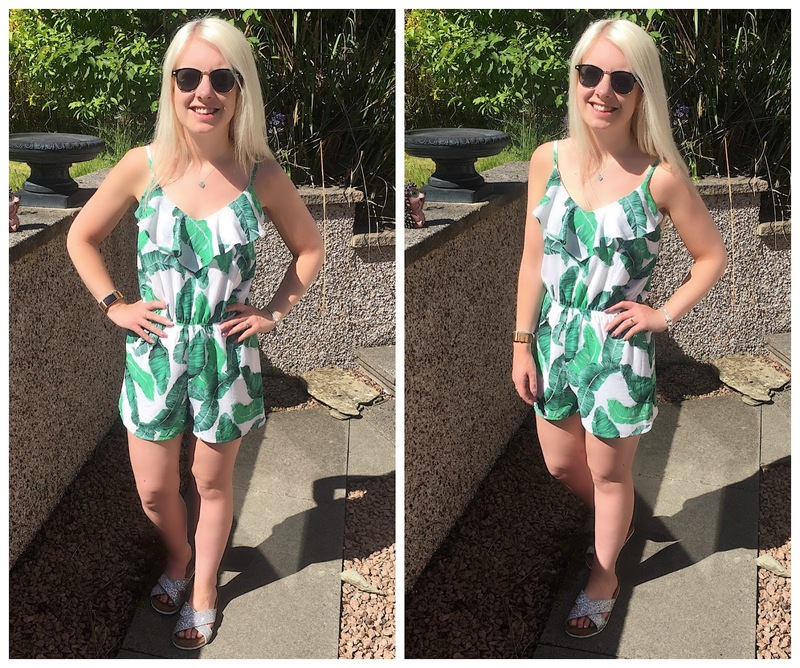 I bought this gorgeous leaf print playsuit from Quiz to wear on my honeymoon and couldn't resist testing it out at home first. It's a lovely material and a good fit. The straps are adjustable which seems to be an essential for me. I wore my glittery sliders from New Look because they're so handy for slipping on and off in-between sunbathing and topping up the suncream or water. My sunglasses are also New Look, I love this style because without the plastic bit at the nose you can pop them on the top of your head without getting your hair tangled. It's the simple things.